The JK was at Blaenau Gwent, South Wales in 2014. The Easter weekend gathering utilised an extensive plateau of open land in between the Heads of Valleys road and the Brecon Beacons national park. 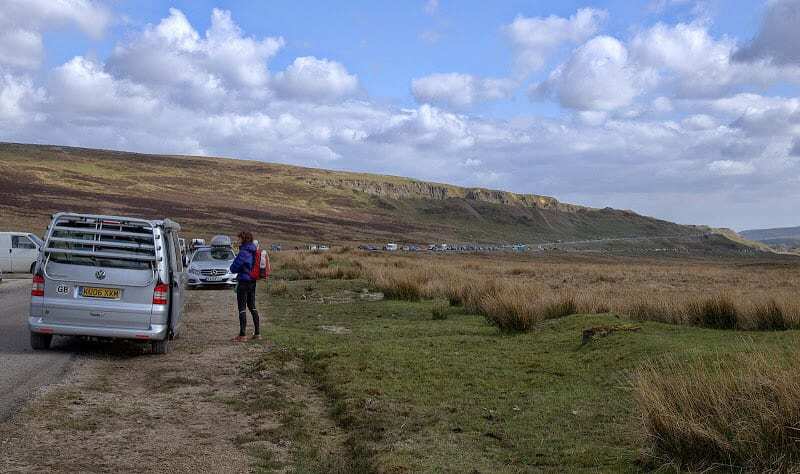 This year’s Easter weekend gathering utilised an extensive plateau of open land in between the Heads of Valleys road and the Brecon Beacons national park. 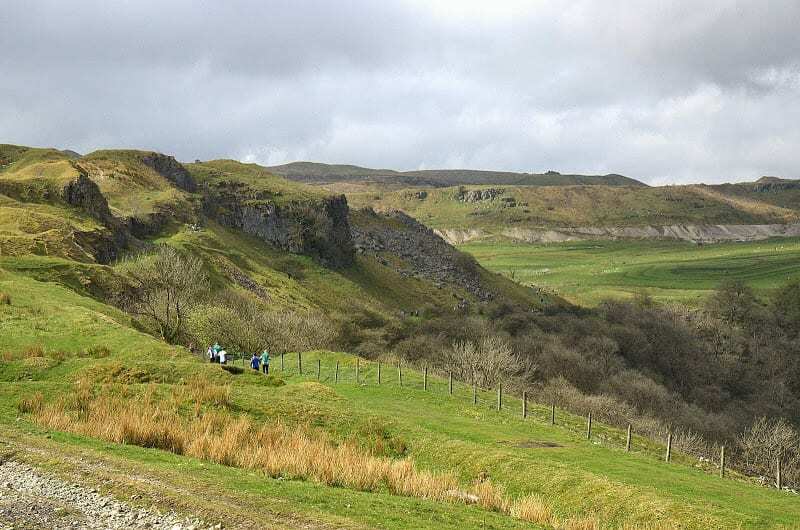 Read the blurb, “high quality terrain, technical orienteering with numerous pits, depressions and sink holes as well as limestone pavements and other rock features. Runnability is generally good”. Strange, didn’t I recall this area as an unremarkable, pretty miserable heathland which missed out on all the decent views the area had to offer? My wife Tamsin and I had slurped, slodged and complained our way through a seemingly never-ending quagmire from Beaufort to Wern Watkin bunk house near Llangattock, five years ago. Confused, I checked theYouTube link on the JK website. The cheesy weatherman presenting the show waxed lyrical about the landscape’s rich history and its old mine workings and the terrain looked good. I was sold. This would be my debut JK and I wanted to make the most of the trip. So I would run a pair of M40 long courses, 11km a day albeit with a low climb by Quantock standards, plus the relays on Monday. Short of fitness, form and experience of the terrain, to cope with my plan I quite literally went back to school, a foundation school being the event base for my first ‘pre JK’ outing at Clydach Terrace on the Wednesday evening, planned by a suspiciously English-accented Welsh Junior squad. 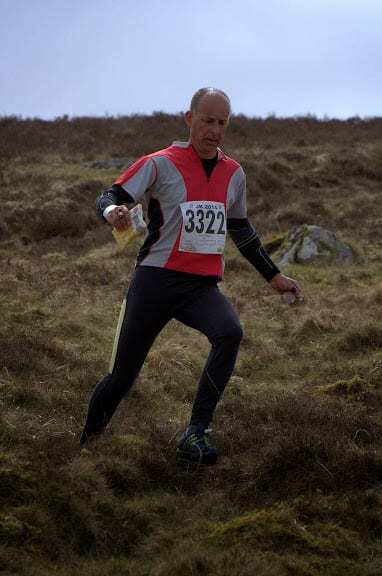 The terrain was anything but kids’ stuff, maybe like Ham Hill or Penhale Sands, with complex contour detail and form lines and similar to that used for the Monday’s relays at Pwll Dhu. Post event, my right ankle was a bloody mess from wearing a steel-spring reinforced ankle brace INSIDE my sock. At least it had prevented my weaker right ankle from turning. Heading to my accomodation booked for the next two nights, I circumnavigate the mountain on an old tramway turned minor road with stunning views. Arrive at YHA Wern Watkin pleasantly drained. No sooner than I park my car, I am greeted by a well-spoken jolly man in the mould of a TV history enthusiast. “Are you Mr Pakes? Ah, I’ve been trying desparately to get hold of you. There’s been a mishap, a double-booking but don’t worry, I’ve got you somewhere”. The stables, perhaps? Well, with 3,500 attendees at the JK, all affordable beds for 50 miles would surely be booked. Wolfing my reheated curry in the kitchen then following the eccentric one-seater car of my “host” on a rollercoaster single track road downhill, I arrived in time for bed at the three-star Old Rectory hotel, complete with adjoining golf course. “You can stay a second night if you like it?” my new idol offered earnestly. I arose suitably refreshed and grateful for the admin error, take a bow Yorkshire’s AIRE club for apparently block-booking the hotel in December. After my usual trick of “walking off” my run (along a canal path), next was a well-attended and invaluable training session on Mynydd Llangatwg on Thursday afternoon consisting of map, suggested courses and scrappy old control kites. Aim: to see how the various features were to be mapped. Rock features usually send me into a sweat, especially when the map symbols aren’t often printed on the map! The sink holes were HUGE as and the pits and depressions way bigger than Quantocks ones. The scree and contour detail was finely mapped and there were some marshes and boulders thrown in (not literally of course). I coped, but a 20 minute mislocation was surely an indicator for what could happen at the big event. Day 1 - Sprint, Swansea Bay? For some, Friday was the sprint race at Swansea Bay. I chose instead to keep my navigation in 3D and boost my stamina with a long hike through the Black Mountains. Then a retreat to Talybont youth hostel and alarm set for 06.45. Saturday’s car parking to the event centre was 2.5km plus another 1km to the start for my 10.30 start slot. Merthyr Common was enjoyable open terrain, similar to Dartmoor maybe but flatter and more technical. I found I was able to navigate largely by using scree, hills and patches of grassland which appeared every so often amongst the heath. After a series of shortish legs, the first long leg of 11 to 12 threw me. Trying to pick the fastest terrain, after 750m or so I lost map contact and stood motionless for several minutes, marvelling at all the detail on the map and my ability to get it so wrong. My subsequent gamble, that I was heading the right way, paid off. A few good legs later, I got complacent and distracted by other runners heading to a control that wasn’t mine. I drift hopelessly across a uniform looking slope. So many pits and depressions and none helping me to relocate! In all, I took two and half hours but relished the challenge. And then I went and forgot my car keys. Greeted at the nearby inn by a skip, bonfire remains (the type that usually contains tyres and petrol cans) and dog turd on the entrance path. The Old Rectory it wasn’t but the welcome was warm, the food excellent and my Saturday night sleep undisturbed. Have another massive breakfast before Mynnyd Llangynidr in the mist, adjacent to yesterday’s terrain. A lesson taken from then was that running on a compass bearing works very well in this terrain as the hillocks are not so big. So I “straight line it” for most of my run, ticking off large features and counting holes in the ground as I go. Slowly and surely is the strategy on most legs, remembering that an error in this mist could cost a lot of time. I finish and chat with familiar faces from QO. Shortly after my run, there’s thunder and lightning and it pours down. Lucky escape! I’m glad I went to the JK, it was very well organised and I didn’t begrudge the long walks to the start, especially given the excellent terrain and the logistical problems the organsing team no doubt faced. I thought my extending the Easter weekend festival to include a pre-JK and a post event wind-down day with the family turned the whole thing into a fantastic holiday.